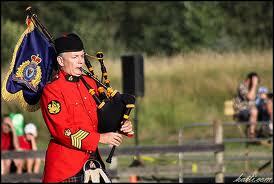 Welcome back to the 2011 RCMP E. Division Pipe Band blog. Our esteemed lead tip/Drum Sergeant, Gwyn MacGregor has handed the band crayon over to me, and I will now start to chronicle some of the activities of this fine group of pipers and drummers for the upcoming year. And it’s shaping up to be an active year. The RCMP E. Division is changing its command – so you can expect to see a lot of scarlet on February 11, at the Seaforth Armoury in Vancouver. Many of the band members are looking forward to this event, as it is an opportunity to play for the RCMP alone. Many of the events we play for are part of larger affairs, such as Remembrance Day ceremonies or other commemorative days such as St. Andrew’s or St. Patrick’s. The change of command ceremony is strictly RCMP – and it’s an opportunity to truly ‘play for the troops’. Royal Nova Scotia International Tattoo in June and July. I’ve taken part in this event in the past. It is a musical extravaganza, a visual spectacle and for the musicians, a wonderful experience. And the pubs on Argyle Street in Halifax are kinda fun too! So, as Pipe Major Hugh said at practice tonight “it’s the second half of the year” so it’s time to put away the sheet music, jog our memories, shake off the Christmas eggnog and begin working on pipe and drum maintenance. The warm summer breezes are only…six months away? Yikes! I best put down my crayon and get the pipes out. RCMP E. Division Pipe Band Member.